Rooibos is the new herbal tea you’ve been waiting for. It has a sweet, yet earthy vanilla taste. It’s caffeine-free. And best of all, evidence is beginning to reveal it has a wide range of health benefits. Something this good is destined to be your next favorite beverage. Rooibos tea comes from the rooibos bush that’s only found on the slopes of the Cederberg Mountains in South Africa. The tea itself is made from the fermented pine needle-like leaves of the rooibos bush. Locals have enjoyed rooibos tea for thousands of years. It had been a secret to the world until it was commercially sold in the 1900s. Now, more than 100 years later, rooibos tea is becoming a tremendously popular herbal drink because of its divine taste and long list of health benefits. Did you know that inflammation is the root cause of most disease? And the unfortunate truth is, chronic inflammation is more common than ever. Between antibiotics destroying our immune system and gut health, unhealthy processed foods, and environmental toxins, we’re all suffering from the effects of chronic inflammation. Luckily herbs like rooibos contain compounds that can effectively fight off unwanted inflammation. That’s because rooibos tea contains three compounds called aspalathin, quercetin, and nothofagin. Studies have found that these compounds can significantly reduce inflammation in the body in more than 4 different ways (1). Another frequent cause of chronic disease, like cancer or autoimmune disorders, is free radicals (2). When unchecked, free radicals cause significant damage to cells along with their DNA. This is called oxidative damage. Without getting too much into the nitty, gritty detail, preventing this oxidative damage is essential if you want to prevent chronic disease and physical aging. This is where antioxidants come into play. Antioxidants protect your body from oxidative damage caused by free radicals. And rooibos is packed with antioxidants. In fact, rooibos tea contains a whopping 50% more antioxidants than green tea (3). Among these antioxidants are two polyphenols known for their powerful antioxidant effects in the body. Aspalathin and super oxide dismutase (4). Studies show that these two antioxidants can protect your body from the harmful effects of free radicals. In doing so, rooibos tea can potentially help reduce the effects of aging and even prevent disease. If overeating is an issue for you, it’s possible that rooibos tea can make your weight loss goals easier. A study published in Phytomedicine: International Journal of Phytotherapy and Phytopharmacology, reported that consuming rooibos tea can increase the body’s leptin secretions (5). Leptin, known as the satiety hormone, is responsible for signaling your brain you’ve had enough to eat. In other words, rooibos can suppress your food cravings. That makes it a fantastic beverage to have after meals. Or you can drink it when you’re most prone to snacking like mid-day or in the evening. The study also noted that rooibos can prevent new fat cells from forming and increase the rate at which fat cells metabolize. It’s just another way of saying rooibos can reduce how much fat you gain and shed it off at a faster rate. Remember how rooibos contains the polyphenol called aspalathin? Besides having antioxidant effects, evidence suggests aspalathin could also have a positive impact on type 2 diabetes by regulating your blood sugar levels (6). This means aspalathin could prevent blood sugar spikes that can ultimately contribute to type 2 diabetes. Another study by the Journal of Traditional and Complementary Medicine concluded that rooibos has a significant therapeutic effect for the treatment and progression of diabetes (7). But these studies were either done on rats or in vitro (test tube) scenarios, so there needs to be more studies on the subject to be sure. Another study suggests that rooibos is not sufficient on its own as a treatment for diabetes (8). Since the results are mixed, it’s still possible that rooibos is helpful for the treatment and prevention of diabetes. It just may not be effective enough to be a standalone treatment. Rooibos can be especially beneficial to those of you who are prone to heart disease or have a family history of heart disease. In fact, a popular human clinical trial discovered that rooibos tea can significantly lower the risk of cardiovascular disease (9). That’s because rooibos contains a bioactive flavonoid called chrysoeriol. This flavonoid has been shown to significantly lower blood pressure (10) and improve blood circulation. Both of which are essential for a healthy heart. There’s also evidence that drinking rooibos tea can significantly improve cholesterol levels. Studies have found that the regular consumption of rooibos tea can increase HDL cholesterol (the “good cholesterol) and decrease LDL cholesterol (the “bad” cholesterol) in people who are overweight (11). Surprisingly enough, rooibos tea contains minerals that are essential for healthy bones and teeth. These minerals include manganese, calcium, magnesium, and fluoride. Manganese, for example, stimulates specific enzymes in the body that are used to help build more bone and cartilage (12). Some of these minerals also work synergistically for better absorption. For instance, magnesium is required for your bones to absorb calcium. 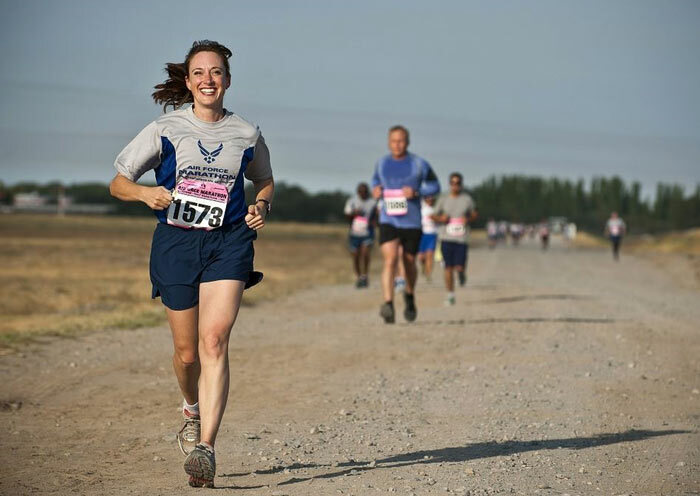 The relationship of magnesium and calcium for bone health is tremendously overlooked. I mean, how many times have you heard “get magnesium in your diet for strong and healthy bones.” That rarely happens. Instead, we only hear about calcium. Magnesium is the unsung hero. Drinking any tea, including rooibos, also stimulates osteoblast activity (13). In other words, it makes your bones stronger by telling certain cells in your body (osteoblasts) to reinforce your bones. The University of Maryland Medical Center claims quercetin, a polyphenol in rooibos, can prevent immune cells from releasing histamines (14). 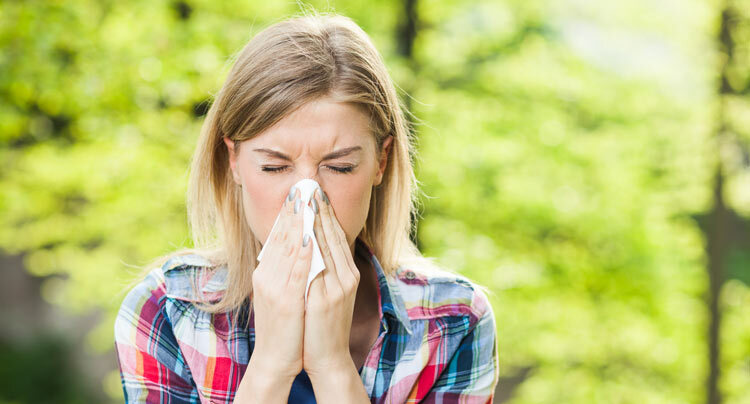 Histamines are the chemicals that are released during an allergic reaction. They are the reason you get itchy, red, and swollen. Unfortunately there haven’t been enough studies to test the actual effects of rooibos on allergies in humans. So far, studies have only tested the effects of quercetin on immune cells in vitro (meaning in a test tube). So the best way to find out if rooibos can help your allergies is to try it out yourself. If you give it a try, put some local raw honey in your tea to give yourself an extra defensive boost against seasonal allergies. Just please don’t go out and purposely trigger an allergic reaction to test rooibos…that wouldn’t be smart. Most teas, like green or black, contain a compound called oxalic acid. It’s also found in chocolate, certain fruits, vegetables, and raw leafy greens. Normally oxalic acid is naturally eliminated through your urine. But when you don’t drink enough water, consume too much sugar, and have a diet high in oxalic acid, oxalate crystals can form (15). This is one of the most common causes of kidney stones. But rooibos tea doesn’t contain oxalates. That’s why it’s a great alternative to green or black tea for those who are prone to getting kidney stones. Rooibos tea is an excellent source of alpha hydroxy acid—a compound rarely found in other foods. Alpha hydroxy acid is commonly found in upper-end cosmetic products because it’s effective at reducing the appearance of wrinkles. But chemically-derived alpha hydroxy acid can cause skin discoloration, irritation, and swelling. So I don’t advise using it. When alpha hydroxy acid is in its natural form, however, it doesn’t have those undesirable side effects. That’s why if you’re looking to reduce wrinkles, it’s best to stick to rooibos tea or rooibos extracts in a skin cream. And skin cream with rooibos is not just another sham cosmetic product. One study, for example, found that a rooibos extract cream is effective at reducing skin wrinkles by up to 10% (16). Considering the study was only conducted over a 28-day period, you could expect to see even better results if used longer. There are plenty of other health claims when it comes to rooibos. The most common are that rooibos improves sleep quality, digestion, and circulation. 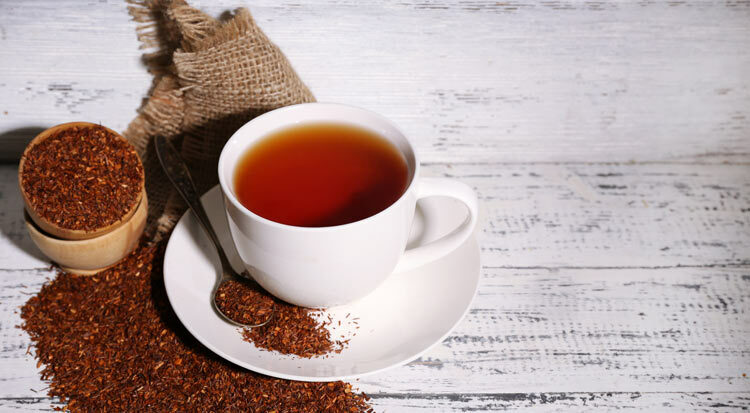 While it’s possible that drinking rooibos can improve sleep quality because it contains magnesium and is a great caffeine-free alternative to normal tea, there’s no evidence that points either way. People also claim that rooibos helps with digestive discomfort because it contains magnesium and potassium. But again, there’s not a scrap of evidence that supports or disproves this claim. And lastly, there’s also some people who swear by using rooibos tea for circulatory issues like restless leg syndrome. Some evidence suggests quercetin in rooibos tea can help regulate the circulatory system (17). So there may be some truth to these claims. So how can you tell if rooibos will benefit you? Since there’s really no downfall to drinking rooibos tea in moderation, give it a try before bed or when you have digestive issues. If it works for you, then that’s all that matters. Rooibos tea should be brewed longer than most teas you’re used to because it contains a low amont of tannins. Brewing it longer allows more of the beneficial compounds to dissolve into the water. This isn’t possible with many other teas because the high concentration of tannins will make them taste bitter when brewed too long. Get ahold of some organic loose leaf rooibos tea. For every 8 oz. of water, add 1 tsp. or 2.3 g of tea leaves to a tea infuser. Place the tea infuser in your mug of choice. Add the water to your mug with the tea infuser. Let the tea steep and cool for 5-10 minutes. Experiment with the steeping duration to achieve your ideal strength and aroma. Double the amount of tea leaves used for hot tea. So that’s 2 tsp. or 4.6 g for every 8 oz. of water. I suggest making a large batch so you can store a bunch in the fridge to enjoy it all week. Bring the water to a boil and pour over the tea leaves into a mug. Let the tea steep in the hot water for at least 10 minutes. I like to wait longer so the tea has more time to cool. Place ice in a cup and pour tea over the ice. Immediately add raw organic honey if desired. Just note that if you put the tea into the cup while it’s still hot, the ice will immediately melt and just dilute the flavor of the tea. Store any excess tea in the fridge to enjoy later. Like anything in life, moderation is key. It’s all about balance. And the same applies to rooibos tea. One study, for example, found that high doses of rooibos tea over a long period of time can negatively impact fertility for men (16). That’s because rooibos can, in large amounts, alter the structure of sperm making them less efficient at their job. Large amounts may also harm liver and kidney function. BUT the same study also reported that reasonable doses of rooibos tea can actually improve fertility. And another study suggests that rooibos tea can actually support liver health by promoting liver tissue regeneration (18). This is a perfect example of how moderation is key—it’s never good to go overboard with anything. My point is, rooibos tea is perfectly healthy if you drink it in moderation. Just don’t go drinking 4 cups a day for the next year. Some people also question whether rooibos tea is estrogenic, meaning it stimulates the production of estrogen in the body. But despite the rumors that are floating around, there’s very little evidence that it has an estrogenic effect. There’s only one study from 2006 that found some compounds in rooibos tea to have estrogenic activity. But this was tested in a test tube using an estrogen ELISA assay (19). So there’s no way of telling whether it has an estrogenic effect in the body. Again, I think moderation is key when avoiding the negative effects of anything. Where Do I Get Rooibos Tea? Rooibos tea has become quite easy to find in recent years. But whether you get it online or at your local health food store, I suggest always buying organic and fair trade. If you want to save money, I also suggest getting loose leaf rooibos tea in bulk. It’s much cheaper in the long run. But if you don’t care or like the convenience of teabags, you can get rooibos tea bags on Amazon by clicking that link. Rooibos tea is a delicious drink that can be substituted for caffeinated or sweetened beverages. Evidence indicates that it may have several health benefits, primarily due to its high concentration of unique polyphenols and antioxidants. But the research on the health benefits is still in its infancy. Considering it’s regarded as safe to consume for most people, it’s certainly worth a try. Plus, it’s a delicious herbal tea that makes a great substitute for caffeinated beverages. Thanks for letting us know that loose leaf rooibos tea can help lower the risk of cardiovascular tea. 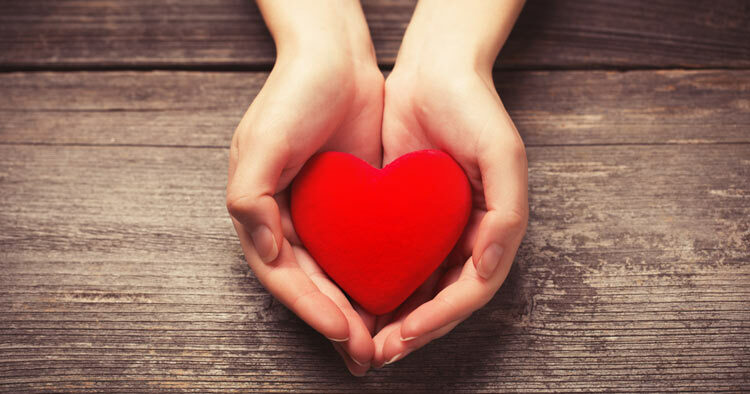 Since my husband just found out that his biological parents both have a history of heart disease, we are wondering what ways we can help decrease his risk of an attack. We will definitely start by having him drink loose leaf rooibos tea.